Edward vom Hofe & Lorenzo Mitchell-Henry. Some time ago I wrote a piece about Tunny fishing and Mitchell-Henry. I have continued to research Big Game fishing and in the last eighteen months I have twice come across a reel that intrigued me. The reel is a size 6/0, 4¼ inches diameter, and capable of holding 600 yards of line. This size is just about big enough to be called a big game reel. The first time was at the Moor Allen auction last February. I decided to leave a bid on it and check it out fully when I had won the item. I was disappointed to discover that I had been outbid. After talking to a few friends about the reel I was kicking myself for missing out on it. Last October the reel turned up at Holt’s auction and again I missed it as I did not know about it. It then turned up at the Mullock Madeley auction and I was able to acquire it. The reel as shown in the pictures was an Edward Vom Hofe and at first sight I thought that it was a model 501 that had been “messed” about with. However upon closer inspection more details were noted and opinions drawn. I did try to contact Steve Brown, currently involved in writing a book on the Vom Hofe family, but he was away fishing. Undoubtedly he will pick me up if I have made some mistakes. How old is the reel? What model was the reel? What were the modifications for? The conclusion that I drew was that this reel was a non standard Edward Vom Hofe reel modified by Lorenzo Mitchell-Henry one of the greatest big game fishermen and tackle inventors. Edward vom Hofe model 501 from the 1908 catalogue. The picture of the model 501 from the 1908 catalogue shows the anti- reverse stud in the 8 o’clock position. The Mitchell-Henry reel has this stud in the just after the 12 o’clock position. Also note that the like the 1908 example the Mitchell-Henry reel has the small sliding button to activate the anti reverse. 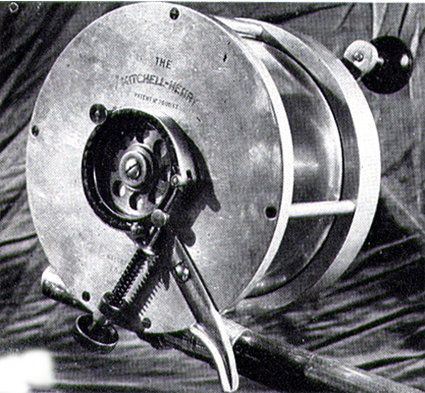 This was changed to a thumb lever shortly after the reels were launched but the illustrations were not updated. The end cap on the face plate has a makers name and the 1902 patent date. This patent was for an adjustable friction drag that was adjusted by a wrench that fitted in to one of three holes. These were situated on the spindle between the face plate and the handle. By about 1916 this had been replaced by a star drag. The reel foot has the number 849 stamped on it. 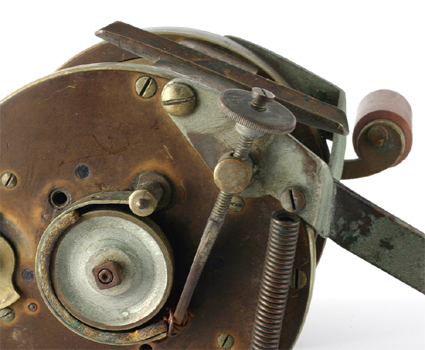 This was either the model number or a serial number and is found only on the early reels of the twentieth century. We can therefore say that the reel was made between 1902 and 1916. The anti-reverse stud was fitted to reels that had no internal anti-reverse pawl. However this reel does have the anti-reverse pawl fitted. 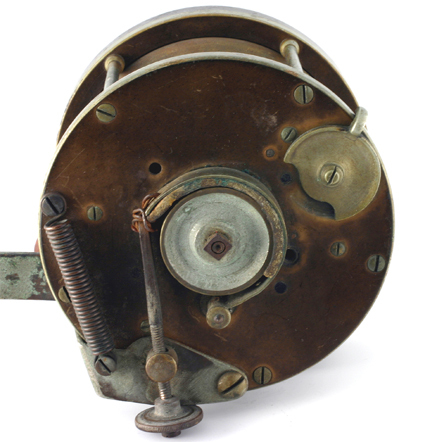 I think that it is safe to say that this reel was originally a model 501 with two factory fitted differences, the position of the anti-reverse stud and the fitting of the anti-reverse pawl. 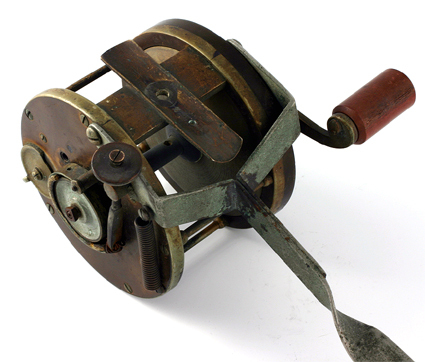 The majority of reel makers were not adverse to making special order and one off reels. The back plate of the reel showing the screw tension adjuster brake pad and brass lined wheel. When we look at the back plate of the reel it looks like nothing that the Vom Hofe family had ever made. 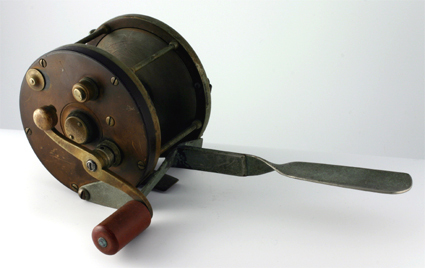 It is in fact very similar to the Mitchell-Henry reels that were introduced in 1927 under patent 299,933. Only in this case the small brake handle has been replaced with a 6½ inch long handle. The brake pad acts on a brass wheel and this pad can be adjusted by the tension screw. Because the handle acts as a lever against the fulcrum and provides a powerful brake capable of stopping most fish. 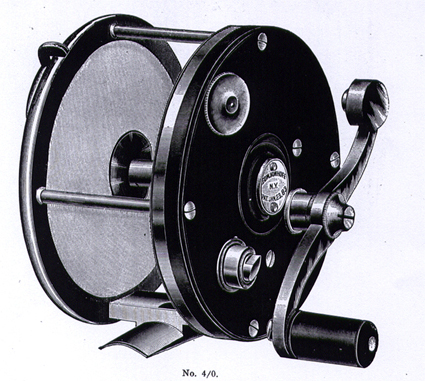 Close up of the Mitchell-Henry reel. The second thing that points to Mitchell-Henry is the handle it is made from Tufnol the brand name for linen shellac laminate. 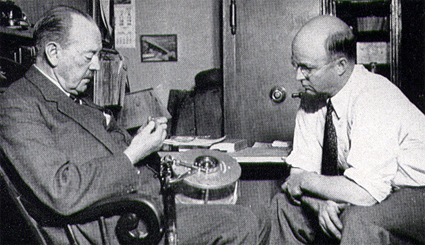 This material was invented in 1929 and Mitchell-Henry did produce a reel made from this material in 1939. It is known that in the late 1930’s he was turning reels from this material possibly experimenting in reducing the weight of reels. The brake handle fixed through the end plates to the reel foot. To conclude I think that he bought or acquired the reel from Vom Hofe sometime around 1910 when he was a regular visitor to American water. With the advances in saltwater fishing tackle it would have soon been discarded. After about 20 years he took the reel removed the ebonite handle and replaced it with a Tufnol one. He then fitted the brake mechanism that he had invented and patented in 1927. What he now had was a reel suitable for catching smaller game fish rather than the leviathans that his normal reels would tackle with a powerful brake system. Bottom of the reel and reel foot. This entry was posted in Big Game Fishing, Edward vom Hofe, Mitchell-Henry. Bookmark the permalink.